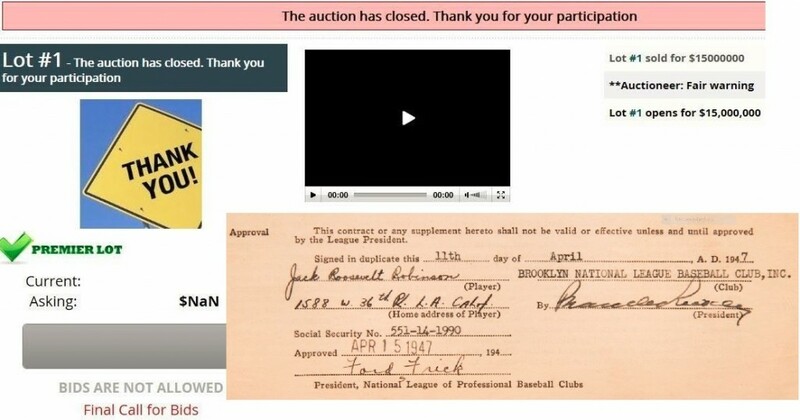 In October of 2017, Hauls of Shame published the first installment of our 3-part report detailing the auction appearances of internal Brooklyn Dodger documents at public auction. Also detailed were allegations that these artifacts including team correspondence, scouting reports and contracts were wrongfully removed from the Dodger offices in Los Angeles decades ago. At the time of that first report, Goldin Auctions had scheduled the sale of Jackie Robinson’s first two contracts with the Dodger organization which have also been questioned as artifacts believed to be property of the LA Dodgers. After the report was published the auction house cancelled its initial sale dates in November and December but recently rescheduled the sale for tonight. The sales were originally advertised as taking place at the site of the planned Jackie Robinson Museum but that location appears to have been nixed as well. The auction house headed by Ken Goldin is selling the contracts in a one-lot auction allegedly in association with the Jackie Robinson Foundation with a minimum opening bid of $15 million. The contracts were appraised at $36 million by autograph dealer Seth Kaller and (according to Goldin Auctions) insured for that same figure by CHUBB despite the fact that the current owner of the contracts, Mykalai Kontilai of Collectors Cafe, purchased the contracts for approximately $1.5 million less than a decade ago when the contracts were the subject of a heated litigation in Probate Court as part of the estate of Wall Street financier Martin Zweig. According to the Goldin website the contracts already have an opening bid of $15 million. Auctioneer Ken Goldin (left) has been promoting the sale of the Jackie Robinson contracts with consignor Mykalai Kontilai (right) who also promoted the contracts with Larry King (center). 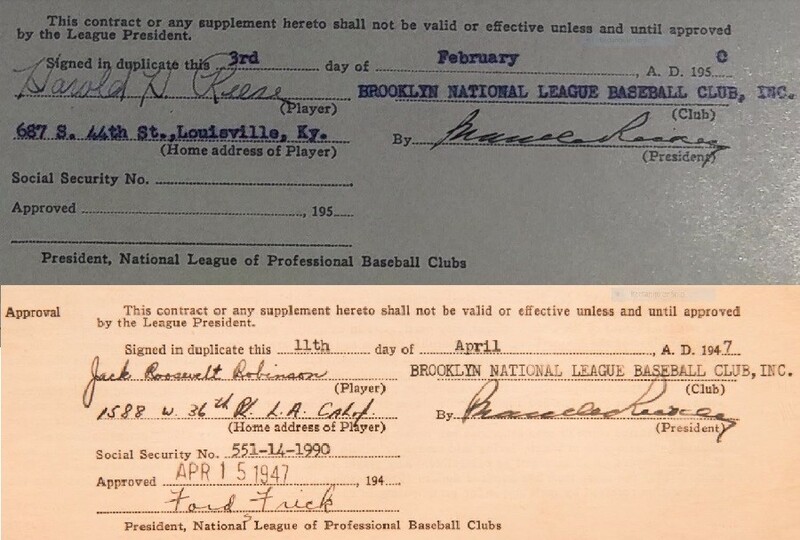 More importantly, Goldin and Kontilai’s claims that the two contracts were owned by Jackie Robinson as his personal copies are contradicted by the actual 1947 contract itself which is clearly the Dodger team copy as evidenced by the National League’s date-stamped approval on the historic document. As illustrated by the sales of several player estates from the late 1940s and 1950’s, the contracts retained by players of that era were not stamped or approved by the league. A previous Goldin sale of Mickey Mantle contracts originating from the Mantle family illustrate this point well as his 1957 contract is signed by only Mantle and the Yankee GM, Lee MacPhail, without any stamp or signature from the American League. Goldin Auctions previously sold Mickey Mantle's personal copy of his 1957 Yankee contract which originated from the Mantle family. Unlike the 1947 Robinson contract it is not date stamped and signed/approved by the American League. Dan Bankhead's family sold his copy of his 1947 Dodger contract and, unlike the Goldin Robinson contract, it is unsigned by the NL and lacks the League date-stamped approval. In addition, Pee Wee Reese’s 1948 and 1950 player contracts sold at auction by the Reese estate were also signed only by Reese and Branch Rickey, while the Goldin Robinson contract was stamped and bears a secretarial signature of NL President Ford Frick. Pee Wee Reese's own 1950 contract (top) is unsigned by the NL while the Goldin Robinson contract is date-stamped, signed and approved by the NL. This contract illustrates that the Robinson copy was part of the Dodger team files and was never owned by Robinson personally. The most damning proof that the Goldin contract belongs to the Dodgers, however, is one of Robinson’s own contracts which was originally sold by his widow Rachel Robinson at Lelands. That 1949 contract is unstamped and unsigned by the National League. Many of Robinson’s other contracts ended up at the Library of Congress and the Robinson family does not know what happened to Jackie’s personal copies of his original agreements. Goldin Auctions does not address the primary issue regarding the contract’s execution by the National League, which is what some consider smoking-gun proof that the contract originated from the Dodger archives. It appears that sometime in the early 1960s both Leagues required both contract copies to be approved by the respective offices of the Presidents, but in 1947 and throughout the 1950s the evidence shows this was not the case. Hauls of Shame reached out to MLBs Official Historian, John Thorn, and business of baseball writer, Maury Brown, to see if they knew the year that MLB required approval of both contracts, but neither was aware of the League protocol. The Goldin auction website currently gives a flowery description of Robinson’s career and the historical importance of the contracts as civil-rights artifacts, however, under the heading of provenance Goldin now includes no information regarding the actual “provenance” of the documents. Why? In our last report we asked HOS readers to contact us with any information they might have related to the alleged thefts from the Dodgers franchise and several did. One reader reiterated a long-standing hobby rumor and stated, “The Dodger items were taken from the archives that were inside the stadium. Wes Parker was the person most responsible for their theft.” The reader also said they would be willing to elaborate with more information providing that the discussion was confidential. 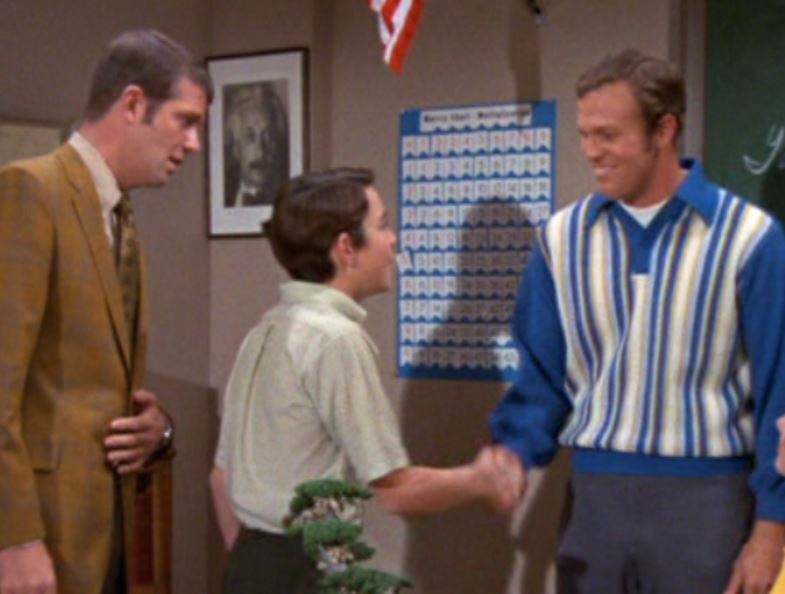 Wes Parker appears on an episode of The Brady Bunch while he was playing first base for the Dodgers. The reader did not follow up with additional information but the accusation echoed the sentiments of other hobby figures including one prominent autograph dealer who told us, “I heard he (Parker) emptied the Dodger offices.” Another veteran hobby executive, however, went a step further when he disclosed that he had interactions with the former Dodger first-baseman and had even unknowingly offered items for sale in the 1990s which are now believed to have been stolen from the Dodger storage. The source told us, “I only know that he (Parker) got into the storage area of Dodger Stadium and took a huge amount of stuff.” He detailed that Parker had allegedly removed “lots of documents and photos” and when we asked specifically if he had knowledge of the former MLB player possessing and selling Dodger contracts the source told us he had “tons” of contracts. The source confirmed that he offered for sale several contracts that allegedly trace back to Parker including; Don Newcombe’s 1949 Montreal Royals/Dodgers contract and his Dodger assignment; Carl Erskine’s 1946 Danville Dodgers contract; Sparky Anderson’s 1956 Montreal contract; and Charley Neal’s 1955 contract. The veteran hobby source also claimed that the Dodgers were aware of the thefts and that the owner at the time, Peter O’Malley, was very upset about the situation. The source also added that Parker was “very close” with Heritage Auctions consignment director Mike Gutierrez who is the prime suspect related to similar massive thefts from the National Baseball Library in Cooperstown during the 1980s. Examples of documents suspected to have been stolen from the Dodger team archive and sold at public auction. Included are a rare letter from Roy Campanella and several player contracts for Brooklyn and Montreal. Wes Parker denies the accusations made against him and told us, “I’m not the guy.” Parker says that he’s been a collector and dealer of memorabilia since the days he set up a table at the National Convention in the early 1980s but states further, “I could see how people would say I got stuff from the Dodgers because I worked for the Dodgers as a roving instructor in the early 1980s and I would buy some memorabilia from a guy by the name of Campbell who was the Dodger souvenir guy. I got some pictures and original paintings of me that were used for memorabilia sold at the Union 76 gas stations.” Parker added that he never owned or sold any of the questioned documents that have appeared at auction including the early scouting reports and correspondence to the Dodgers from Roy Campanella. He did, however, tell us, “I did buy some old Brooklyn Dodger correspondence from Campbell too.” Parker added, “I’ve also consigned things to Lelands, Heritage and Mastro over the years and I did buy some other Dodger correspondence from Buzzy Bavasi but that’s it.” When asked if he had owned or sold Dodger contracts he said, “I did buy a bunch of old blank contracts from Campbell and then I had Erskine and Snider and others sign them along with Buzzy (Bavasi) when I saw him in San Diego.” Parker denied that those contracts were ever sold by him as vintage original Dodger team contracts. The claims of thefts from Dodger Stadium and the accusations leveled by our sources against Parker, in addition to the unverified provenance and evidence of Dodger ownership, make the current sale tonight of the historic Robinson contracts by Goldin even more problematic. Regardless of how the Dodger documents were removed from the team facility, the evidence still shows that the Robinson contracts appear to be Dodger property. In addition, whoever did remove the documents would likely never be prosecuted based on the statute of limitations. There is, however, precedent for MLB to intercede and stop the sale of its official documents as sources indicate lawyers for Baseball stopped the sale of the manuscript of the National League Constitution at SCP Auctions last year. MLBs public relations , Matt Bourne, did not respond to our inquiry as to MLBs stance regarding the historic Robinson contracts. Hauls of Shame reached out to Ken Goldin for comment but the auctioneer did not respond to our inquiry. Goldin also did not respond to our recent inquiries regarding his sale of documents stolen from the Baseball Hall of Fame and the New York Public Library which appeared in his last online auction. Goldin did appear on Fox and Friends this past Saturday promoting the Robinson sale. Hauls of Shame has also communicated with representatives of Peter O’Malley and we are currently waiting for a response to our inquiry from the former Dodger owner. When we called the offices of the Los Angeles Dodgers for comment media representatives claimed that all staff with the ability to issue a statement were currently at Spring Training. The Jackie Robinson Foundation had no comment regarding the claims that the Robinson contracts appear to be Dodger property or confirm whether the Foundation was agreeing to receive 100% of the buyers premium as indicated in the Goldin auction description. Media representative Gary Mendez told us he was checking with the Foundation’s President for authorization to issue a statement. Please check in for continuing coverage of the “Dodger Document Dilemma” in our next and final installment of this special report. UPDATE: The live Auction at Goldin ended without a sale although Goldin reported a $15 million opening bid and made no reference to the contracts failing to reach a hidden reserve price after the auctioneer was unable to attract a bid topping the alleged $15 million bid. I even saw that Fox News is picking up this story. It’s just getting started. When Goldin was on Fox and Friends he repeated the story about the unidentified Brooklyn historian having the contracts in his “vault” for 50 to 60 years. Leon would like to again thank Ken Goldin (hi Ken!) for allowing Net54 to help spread the word! The auctioneer and owner do NOT want anyone to know who owned it previously. They know it was Martin Zweig but they dont want you to know, and they don’t want you to know who the mystery man brooklyn historian was that owned it before Zweig because then people might start backtracking the chain of ownership on this thing. The current owner bought the contract after Zweig had died, but says that Zweig and the previous owner did not wanted to be anonymous. That is NOT true, they were dead already! They couldn’t tell him that they wanted to be anonymous. the auctioneer and owner want them to be anonymous for their own reasons. The current owner bought the contract after Zweig had died, but says that Zweig and the previous owner did not want to be named, that they wanted to be anonymous. That is NOT true, they were dead already! funny to see leon post on stolen material. or lecture anyone on stolen property for that matter. maybe they should handle it “quickly and quietly” as well? Think Wes and Barry Halper had dinners in Beverly Hills? The looting at the NYPL and team storages must have been huge. I hope the Dodgers get good lawyers and poke. I had an opportunity to visit a storage room deep inside Dodgers stadium in about ‘77 or ‘78. I was 16 or 17. One day, on a whim, I simply showed up at the Dodgers Stadium box office, and I asked a Dodgers employee if they had any old baseball stuff lying around. Amazingly, someone led me down a storage room, handed me a box something like, “You can fill up the box, and I’ll be back in 10 minutes.” The place was packed with programs, yearbooks, pennants, picture packs, color 8×10s, facsimile balls and all sorts of items. I have no evidence there were contracts in there, but the volume was immense. I understand now why Dodgers stuff from the 60s has so little value — they made too much of it. I couldn’t have possibly gone through everything in 10 minutes, much less 10 hours. I ended up walking away with my box filled, but most of the stuff I got was fairly common. I bring this up because if a clueless kid was given this opportunity, imagine all the other people who had access to this stuff.